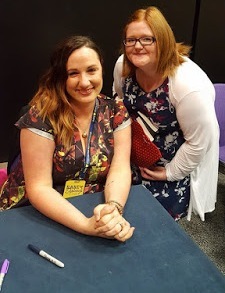 Blogoversary Day 6: Character Interview: Riley from Jana Olivers The Demon Trappers. Today I am so happy!! :) I have an interview with RILEY ANORA BLACKTHORNE!!!! Question I have to ask! I know you want to follow in your father's footsteps but why do you like being a demon trapper so much?Well, to be honest right now I'm not finding the job that much fun. I like the challenge of demon trapping, but it's a lot harder than I thought. Still, I keep Hell from taking over and ruining peoples' lives so that's all good. You've faced some pretty hard obstacles in your life, what's been the hardest?Losing Dad and Mom was the worst. They always had my back, even if I screwed up. The rest of it is pretty ugly, but without them here it's way harder. You don't really see what others see. Beck likes you!! (Trust me! I'm not like Justine.) Will you ever admit that to yourself? Cause I'm sure there's other girls who would have him. :)I think he likes me, sure, but his "my way or the highway" thing is really hard to handle. I'd like him a lot better if he wasn't in my face all the time, you know? I know some of that is because I'm in his face, but sometimes I just can't help it. And Justine? Let's just no go there, okay? ~ Is there anything specific you want to say to the readers?Wow, you guys are really nice to care about my screwed up life. Here's hoping it gets better soon. Click on the tab above titled Blogoversary for all info on the 10 day schedule plus info on how to contact the authors involved and about the giveaway and contests. Rafflecopter now available for main giveaway. What did you think of the Interview?? Have you read any books in The Demon Trappers Series?? Love the interview! Looking forward to Becks interview as well! I love these books! I've read the first two and the third is on preorder! I read snippets that Jana posted on the website for it and I'm looking forward to hearing the full lecture Peter gives Riley that I got a little glimpse off! Just those couple of lines made me love Peter more and look extra forward to reading the third book when I get it! I have to thank Tiffany King for introducin' me ta these books,absofrinkinlutely loved The Demon Trappers Daughter!Can't wait to read more!